St. Margaret Mary's Church and School continue to build a great relationship rooted in the rich history of the Catholic Church in this region and city but adapting to the changing needs of our community. There are about 250 regular worshippers at Mass. You can see service times on our Mass Times and Diary Dates page. We have provision for young children and we serve refreshments in the school after mass. Members of the church serve as Foundation Governors in the school and in more informal ways. There is support too for the Friday Mass in church for the school pupils and staff. We support - in prayer and practice - the learning and pastoral support necessary to build a thriving and happy school. We will continue to do this as the school expands over the forthcoming years. Father Simon Ellis is the parish priest, who originally was an Anglican (Church of England) priest. He moved with his family into the Catholic Church in 2011 after Pope Benedict’s invitation to Anglicans to build unity in the faith, creating an organisation - the Ordinariate of Our Lady of Walsingham - to facilitate unity. 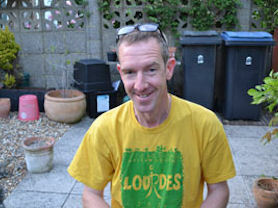 Fr Simon was born near Cambridge and has a background in education, qualifying for teaching secondary science and maths in 1990. He taught in Stoke on Trent before training as a priest. He came to Birmingham from a Jesuit School in Sheffield where he was the Senior Chaplain. Fr Simon took over the reins from Fr Richard Sharples in Perry Common in 2016, being inducted into the parish on 25 September by Bishop Robert Byrne, Auxiliary Bishop of the Archdiocese of Birmingham. Fr Simon stated when he came to the parish that the priority "will be reaching out to everyone in the community, continuing to build the church and the school into a thriving centre for the good of our young people and their families". This is, therefore, an exciting time to be in Perry Common. 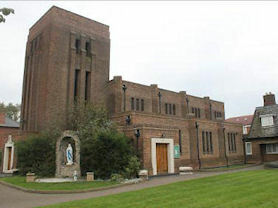 St Margaret Mary Church began as a community in 1926, and the present building was built between 1936 and 1937, designed by architects McCarthy and Collings of Coalville, Leicestershire. The building is brick with a flat roof. The main body of the church is of four bays with tower and porch to the west, an aisled nave and sanctuary, there is a narthex and a gallery at the west end of the building. Refurbishment works including the wall stencilling was carried out by architect Daniel Hurd in 1995. A redecoration was carried out in 2018. There is a further refurbishment of the gallery planned for 2018.